Dave Swarbrick, the ultimate English folk and folk-rock fiddler, also vocalist, cunning viola, guitar and mandolin player, has passed away much too early, of course, only 75 years old. Though he struggled with bad hearing for decades due to too many loud electric concerts and bad health due to excessive smoking. In 1999 The Daily Telegraph published an obituary about him while he was ill in hospital... When he recovered he photocopied the obi, signed them 'RIP Dave Swarbrick' and sold them at gigs. Until the paper got in touch and told him couldn't; he didn't have the copyright... However, after two SwarbAid concerts organised by Fairport bassist Dave Pegg and his wife, he received a double lung transplant in 2004 that improved the remaining years of his life. Dave started his folk career in the 1950s and debuted on record in 1962. 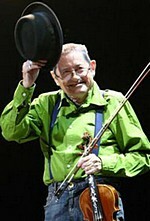 He was a member of the Ian Campbell Folk Group from 1960-66 before he founded a duo with fellow folkie Martin Carthy. They kept playing together on and off for most of the rest of his life. In 1967 he recorded his first solo album, sort of, Rags, Reels & Airs helped out by Carthy and Diz Disley, also named on the cover, with smaller letters. The album was produced by legendary American-turned-Englishman Joe Boyd. Two years later Boyd called Swarb and asked if he could help out on a recording session for Fairport Convention's third album Unhalfbricking. His electric fiddle playing along with the band's electric instruments on the song "A Sailor's Tale" was the start of British folk-rock. A few moonths later he was a full member of Fairport, recording the seminal complete folk-rock album Liege & Lief. When Sandy Denny and Ashley Hutchins quit after the recording of the album and Richard Thompson abandoned ship one more studio album down the road, Swarb gradually took over as the leading man of the band, even when Sandy rejoined for a little while in 1974-75. Dave was gradually turned into the lead singer as well, before she arrived and after she left again. He struggled on with Fairport until the band dissolved, for a while, in 1979. He didn't join when Fairport reformed permanently in 1986, but has played with them on several occasions before and after, not least at the annual Cropredy Festival. His greatest achievement with Fairport was maybe the album "Babbacombe" Lee from 1971, telling the story of an Englishman they couldn't hang. Well, they tried three times, but the gallows didn't work properly and Lee survived. Is this is the only full-blooded folk-rock-opera around? After Fairport, Swarb went back to acoustic folk in smaller venues, not least due to his hearing problems. He must have played with around four generations of folk artists in Britain, and some in Australia and Canada, too. In the early 1980s he collaborated with Simon Nichol of Fairport for a while, later formed the folk quartet Wippersnapper with Chris Leslie, Kevin Dempsey and Martin Jenkins and renewed his teamwork with Martin Carthy. He moved to Australia for a while in the 1990s, but was forced to work less due to his ill health. When he was back after recovering from the lung transplants, he formed the new band Dave Swarbrick's Lazarus, named after the obituary incident, and gigging and recording with them and several others and as a session man at full force. As late as in 2014 he recorded the critically acclaimed album Lion Rampant with Jason Wilson, helped out by other veterans of the British folk circuit. Swarb will be sadly missed. However, his merry fiddle sound will live on. It can be heard on dozens, maybe hundreds of albums from his recording career spanning about 55 years.